Google Chrome is up to date Version 68.0.3440.84 (Official Build) (64-bit) running on Windows 10 Pro 64 bit OS, x64 based processor. In Settings Chrome reports "This application could prevent Chrome from working properly. Stardock Start10"
That is strange, I can not see in what way Start10 effect how a web browser work. However, I have forwarded your question to Stardock Support team for their assistance. Please keep an eye on this thread for any updates. We appreciate your feedback and patience. It's hard to imagine how nor have we had any other reports. If it is not impacting your use of either app, we would consider it a false positive at this time. If that changes (more reports or that you see that it is impacting either app negatively) we would look at it with more scrutiny. Additionally, this feature is currently considered experimental so not all users will see these warnings. Basically Google's browser is unstable and when it crashes they are blaming everything that loads that's not them. Ignore it, Start10 is not responsible for any Chrome crashes. Please read two reply above you. Reply #4 and #5' That should answer your questions. I too received the same "warning" and figured out a really simple way to avoid it... stop using Chrome!! It also flagged a number of other applications as being incompatible and suggested I remove them, including anti-malware and other security programs. So now we have Google suggesting we make our systems less secure! The sad thing is that there will be those that slavishly follow Google's "advice" and end up compromising their systems. So far as I am concerned, it is Google's responsibility to ensure they have the necessary options in place to allow users to selectively ignore their (spurious) recommendations. Until then, Chrome will reside alongside IE, i.e. redundant!! The way I read this is that at sometime in the future, Chrome may provide a "whitelisting" feature for programs that you "know" to be safe - i.e. ; Stardock and therefore stop the warning/remove screen from appearing. For now it appears that since this only comes up when you first launch Chrome, you can choose to ignore it and just close the tab. I'm not sure if I'm reading the article correctly as to whether Chrome will actually interfere with the operation of programs that they find incompatible. It looks as if they will block any program in real-time that actually tries to "inject" code into Chrome's operation. Chrome at this point isn't just warning users about incompatible programs it's actually recommending to remove such programs with a button to enable users to do this. In my list are 3 Stardock programs & Kaspersky Internet security. As I mentioned on another forum a young lady I work with whose PC I maintain? was so worried when Chrome's box came up she attempted to uninstall Kaspersky. This didn't work properly so she had no AV whatsoever not even Defender & a barely working PC. I ended up driving over reinstalling Kaspersky & setting Edge as default browser. It does mention in the Chrome warning box these programs 'may' interfere with Chrome! IMO they have gone about this in a ridiculous way even if you see Googles point. I wasnt sure who'm to trust anymore..
You see.. Now this is one of those reason why i stopped using chrome. I have been using firefox from the beginning and it never failed on me.. Google Chrome starts to be sounding malicious to me.. I only use chrome to watch youtube on it.. Because the engine of youtube is made that way that it works better on google chrome..
"Basically Google's browser is unstable and when it crashes they are blaming everything that loads that's not them. Ignore it, Start10 is not responsible for any Chrome crashes." I have the same issue, and I need to use Chrome. Refer to reply #5, please. Google is just going to have to make some changes as the net of apps its flaggins is not limited to Start10. What is scary, if not said already, is why Chrome is looking outside its obvious perview - why it is looking at other installed apps at all? From my reading it seems Google feel any programs/apps that may inject into Chrome (may) cause lack stability & security issues? I would think that a PC that has had it's anti-virus system removed will become even more unstable when inhabited by malware. I just does not make any sense, again from my reading the list of programs that 'may' cause instability to Chrome was complied arbitrary anyway. I am a big fan of Start10 but I'll have to side with Google on this one. This has nothing to do with them being a big bully, it's their product and they have the right to decide what code is being injected into it for security and reliability. It's being used by roughly 60% of the users in the world. (http://gs.statcounter.com/browser-market-share#monthly-201809-201809-bar) I think in this case I'd like to hear a developer that would probably like to continue to sell their product discuss possible remedies. What code is being flagged by Chrome? Is there a workaround? I can't tell my company that I'm not going to use Chrome as directed due to a specific plug-in because I like my Windows to look a certain way. I'll continue to purchase Stardock products, but if they bump heads with my primary browser I guess I'll have to live without their products. I hope there's a solution that allows me to continue my support. I still feel the issue is the list of programs that Chrome will suggest you uninstall & they (Google) provide the means to do so in a browser pop-up up was complied arbitrary (subject to individual will or judgment without restriction; contingent solely upon one's discretion) so programs Google suggest you uninstall may never have caused issues & potentially does not inject harmful code into Chrome. I've read many posts very similar to the one above on several sites by 'ivancamp' & if the list of programs had been compiled by programs known to cause programs fair enough, but that is not the case. For me few other companies associated with Windows products if any could have gone around this issue as Google has, ie: uninstall all programs we feel could cause our browser problems if Chrome crashes, even if the program is the single AV solution on the PC. For me & in IMO that is bulling of the highest order. I am a big fan of Start10 but I'll have to side with Google on this one. You are ok with Google telling you what programs you should/not use - even ones that have no hooks into Chrome at all (Start10 does not)? It's not whether I'm okay, many people are in a computing environment that is dictated by necessity. Start10 isn't necessary it's personal preference for me, my Admin doesn't care that I hate how Windows 10 looks. 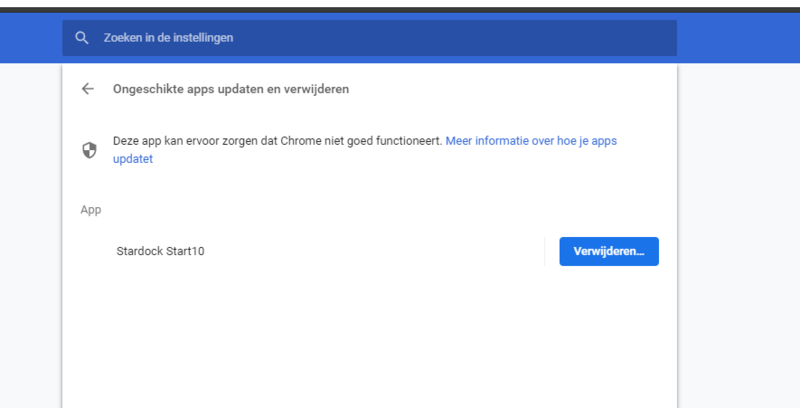 I also don't understand why a representative of a company wouldn't at least show some concernfor the opinions of a paying customer, I want this warning to go away, I want Chrome to stop closing because of it, I plead my case to Google support and I did the same here. Looking in to how to fix this on your end would at least be a fiscally beneficial concept considering there are as of August 2018 over 2 billion installs of Chrome. It isnt ok for software to sniff into your computer just like that, especially for google! That is a privacy statement. The maker of ccleaner just got burned down on their forums because they were monitoring their users. A lot of users lost trust on piriform. True Google Chrome is one of the biggest used browser out there.. Though this still doesnt make a browser trust worthy. A lot of users relay on Google and Microsoft because they are on the biggest company's. They are both breaking the privacy law. That is a big concurn by a lot of users.